I take a lot of photographs of a lot of different things in the Panama City and Panama City Beach area, but working with couples has to be one of my favorites. When Jeet phoned me wanting a beach wedding photography session after her intimate wedding ceremony to Raj in Panama City I was exited for the opportunity to photograph the newlyweds. For our beach session, we decided upon to one of my go-to beach locations, St. Andrews State Park, which is located on the far east end of Panama City Beach. 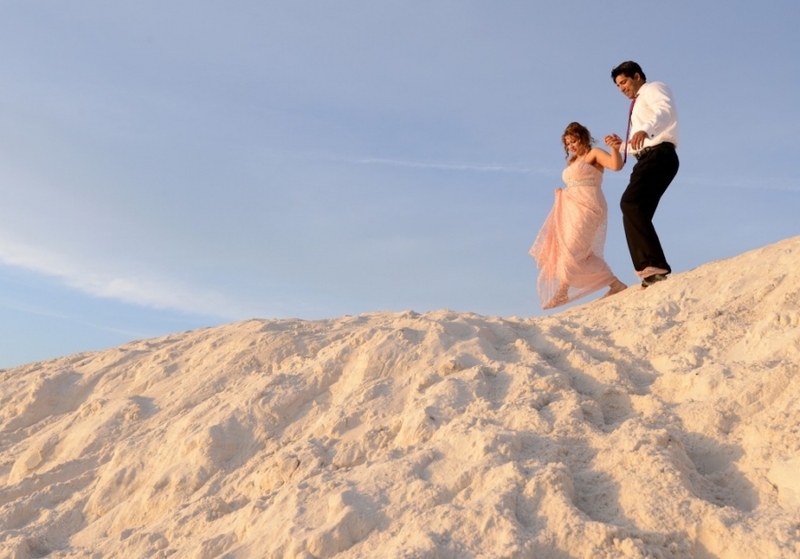 The park offers several different looks and is a spectacular location for Panama City Beach photo sessions. When the couple arrived and got out of their car, they were looking sharp! These guys looked like they stepped out of a magazine or something. Not a hair was out of place on Rajâ€™s head and Jeet had on one of the most beautiful necklaces I have ever seen. At that point I knew that the session was going to be a breeze because there was no way I could take a bad photo of this couple. The sky was beautiful and the air temperature was almost perfect for our session. The only problem we had was a little wind, but it helped keep the air temperature at bay. As the surfers caught waves in the background we captured some beautiful images of the freshly-married duo to the backdrop of a stunning Panama City Beach sunset. Raj and Jeet are a sweet couple and it was great to be able to spend some time with them on one of the most important days of their lives. Congrats, you guys!